A Cloak Clasp that is a one of a kind. The dragon cloak clasp is so pretty, I love the work you do with gemstones. Of course, butterflies are my weakness…what’s not to love about a combination of dragons and butterflies! 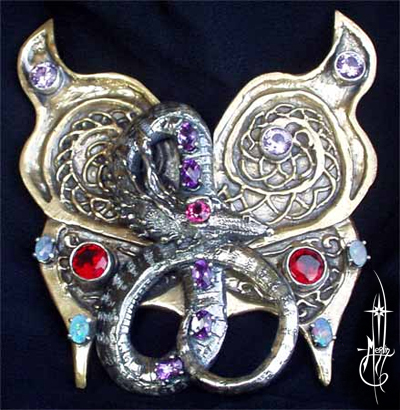 I had no idea that this piece of jewelry showed up at DragonCon every year…I will have to check out the photos. Of course it shouldn’t surprise me because your work shows up at ShevaCon every year too. Anyway, nice work….makes me want to go buy a cloak.